Game streaming is the ability to play Xbox One games remotely from your Xbox One console on any Windows 10 PC on your home network. This feature allows you to leave your living room and play your favorite Xbox One games anywhere with access to your home network. Game streaming uses the power of the Xbox One console to manage the game. Your Windows 10 PC becomes a remote second screen so you can roam freely around your home while continuing to enjoy your Xbox One console and games. Xbox One console: Game streaming must be enabled in Settings. Windows 10 PC: You must be signed in to the Xbox app with the same gamertag as on the Xbox One console. Powerline network adapters – These adapters allow you to use the existing electrical wiring of your home as a high-speed wired network. MoCA (Multimedia over Coax) – These adapters allow you to use the existing coaxial cable wiring of your home as a high-speed wired network. Under This Xbox, enable Allow game streaming to other devices. 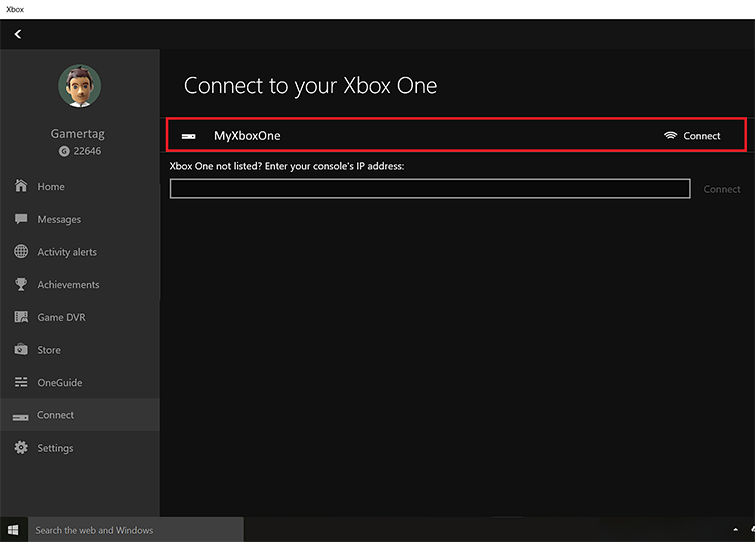 Under Other devices, enable Allow connections from any device or Only from profiles signed in on this Xbox. Select Connect from the panel on the left side. 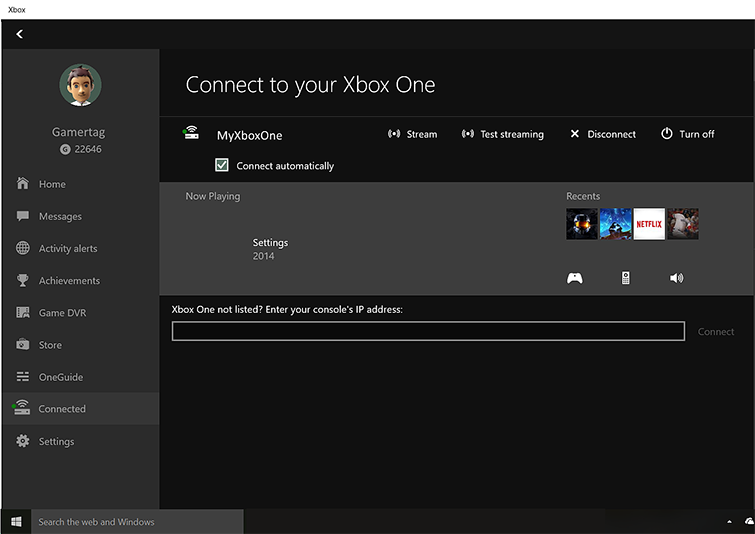 The Xbox app will scan your home network for available Xbox One consoles. Select the name of the console you want to connect to. Note All Xbox One consoles are pre-named "MyXboxOne." If you have multiple consoles, you should rename each one so that you can correctly identify the console you're trying to connect to. You can rename your console by pressing the Xbox button to open the guide, selecting System > All settings > Console info, and then selecting the name of your console in the Name box. Once you have connected, you'll see the icons change to indicate you are connected, and you'll see new options for streaming, power, and media remotes. You'll also now have control of the console remotely. To begin streaming, click Stream once the console is connected. Connect your console to your PC, as described previously. 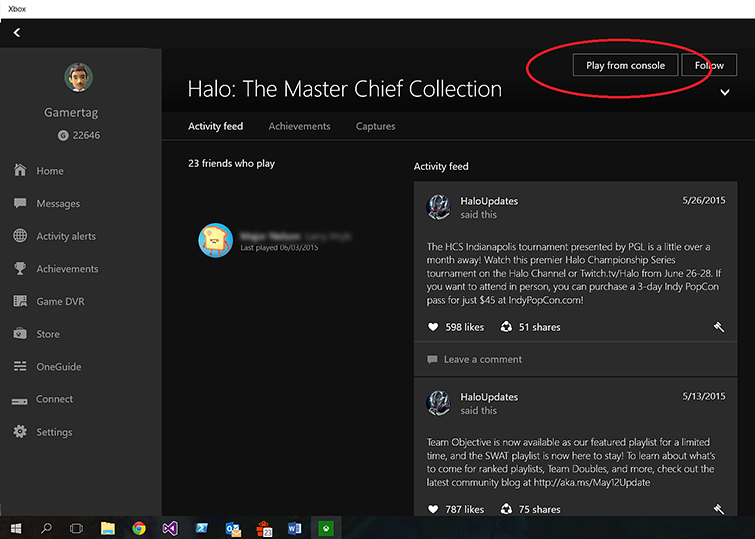 After you click on any Xbox One game in the Xbox app, you can initiate streaming from within that game hub. Just click Play from console in the upper-right corner of the screen. The game will be immediately launched on the Xbox One console, and streaming will start. 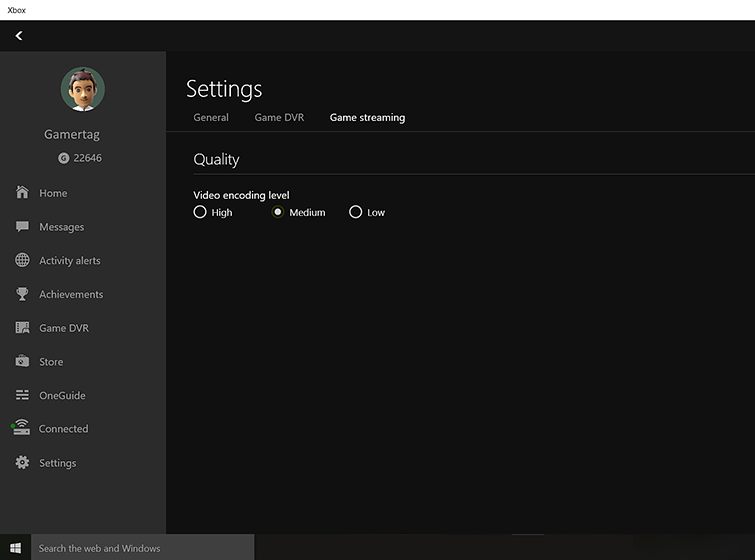 After your PC is connected to your Xbox One console, you can select a quality level for the video. You can change the quality of your stream before you start streaming or while you are streaming. You should set the quality to the highest level that still gives you a good gameplay experience. In the Xbox app, click Settings, and then select Game streaming. High – If both your Xbox One and your Windows 10 PC are connected with a wired Ethernet connection, or if your console and the PC are in the same room as the wireless router with minimal wireless interference. Medium – For 5 GHz wireless networked PCs and consoles that are in different rooms within your home. Low – For low-end PCs and tablets, as well as 2.4 GHz wireless networks. Note You can always start with a higher setting and reduce your quality level until you reach the best performance your home network will support based on your current configuration. To try to improve your game streaming experience, see Improve Xbox app for Windows 10 game streaming performance. Note As mentioned in System requirements, your Xbox and PC need to be on the same wireless network. Make sure your Xbox One is on and you’re signed in. On your PC, sign in to the Xbox app with the same profile you’re using on Xbox One. Open the Oculus app and sign in with your Oculus account. Search for “Xbox” and install Xbox One Streaming. Open Xbox One Streaming and, if necessary, choose your Xbox. If there’s only one Xbox on your network and it’s turned on, the app will choose it automatically. If the app doesn’t see an Xbox, make sure your Xbox is on and you’re signed in. If you need to connect to your Xbox using its IP address, you’ll find the IP address in Settings > Network > Network settings > Advanced. Put on your Rift headset and start using your Xbox. While streaming to Oculus, the Xbox button on your controller opens the Oculus universal menu instead of taking you to Xbox Home. To use the functionality of the Xbox button , move your head to aim the cursor at the virtual Xbox button and either press the A button on your controller or long-press A to act on notifications or open the power menu. To adjust streaming quality—for instance, if you’re adjusting for a slow network—move your head to aim the cursor at the Network icon below the screen and select a lower quality level (the default level is Very High). Protected video and HDCP-protected content can't be streamed with game streaming. This includes protected HDMI television content as well as the content from many media applications. Plug your USB headset (or microphone) into your Windows 10 PC or your chat headset into your controller before beginning game streaming. Your headset must be selected as the default playback and recording device on your PC. To access this setting, open Control Panel, select Hardware and Sound, and then select Manage Audio Devices. Would you like to contact Support regarding the "How to use game streaming in the Xbox app on Windows 10" issue you were reading about or a different issue?